BarCamp Prishtina continued its journey of interesting meetings, gathering in one place different people of different backgrounds to share their unique ideas and innovative works. On the fifth round, four guest speakers were invited organizing thus one of the most intense BarCamps which reached more than 300 attendees. Presentations on the Kosovo Innovation Camp, online application for reporting corruption – kallxo.com, rockets and science in Kosova: willpower is the key, and life in and with Internet, were the stories told at this BarCamp. Ron Salaj, Faik Ispahiu, Gëzim Basha, and Fisnik Ismaili were the enthusiastic and energizing guest speakers. Activities of UNICEF Innovation Lab, projects, successes, possibilities that are offered for other people to be involved and issues related to the Social Innovation Camp project were the main topics around which Ron Salaj spoke. 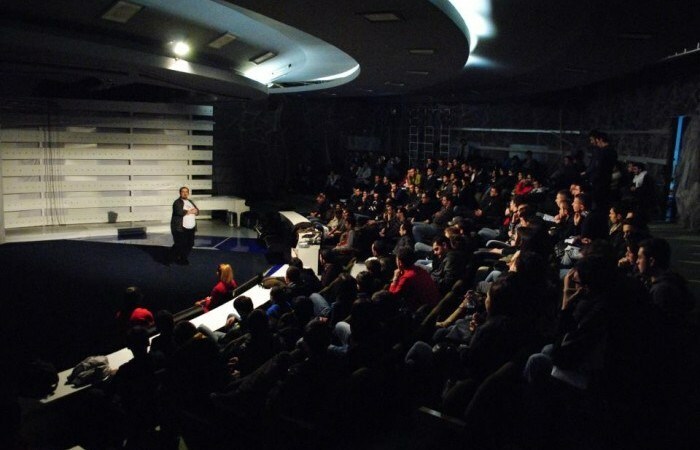 His journalistic experience and the possibility that is given to society to report in kallxo.com web page was the main subject of Faik Ispahiu’s speech. He brought to the BarCamp audience his experience from BIRN, a leader in investigative journalism in the region, legal problems and possibilities that people have to be part of BIRN activity. On the first season of BarCamp Prishtina, Gëzim Basha brought his experience of creating one simple rocket within the American School of Kosova, difficulties during planning and building it, and some future plans. Following Gëzim, Jon Konjufca spoke about mathematical calculations of their team. An outsized personality in the design and tech scene in Kosovo, Fisnik Ismaili, in an outstanding speech, presented his personal history regarding the Internet development from 90s until today.